Many are anticipating a 'ripple effect' that could sweep across the region and topple one ruler after another. The collapse of communism in the Eastern Bloc countries seems to be the favoured precedent for this 'prediction'. I have to admit that I don't quite see the similarities. The Eastern Bloc countries had much more in common than Arab countries have today, and were furthermore firmly controlled by the Soviet Union. By contrast, Arab countries vary from each other substantially. A small oil-rich country like Qatar has very little in common with a large and diverse country like Sudan. Even two neighbouring countries like Tunisia and Algeria, despite undergoing similar historical experiences, are today difficult to compare. What most observers are missing is the historical specificity of each country beyond the stereotype of an oppressed population dominated by corrupt rulers. To a certain extent, this is partially due to the legacy of pan-Arabism. Despite the failure of pan-Arabism as a political project, it remains powerful in the social and political imagination of many Arabs, if only at a rhetorical level. The dream of Arab unity is a fantasy, but a very powerful one at that. The referendum in South Sudan for example was greeted with hostility by most Arabs, despite how little they know about the conflict there and the nature of the struggle of the Southern Sudanese. Any secession within the Arab world, particularly by non-Arabs, is automatically treated with antagonism. The reaction to the Tunisian uprising in the Arab world is a sort of flip-side to this: most choose to see the uprising in the Arab rather than the Tunisian context. Much like with the Palestinian struggle before, the courageous actions of the Tunisian people have been appropriated as if the Tunisians are fighting a battle in the name of all Arabs. 'We are all Tunisians now', some like to think, but we are not. Such an attitude only demeans the Tunisian uprising and dislocates it from its context. This is the struggle of the Tunisian people for freedom, not an Arab fantasy. But the symbolism of an Arab dictator fleeing in face on a popular uprising seems to have overridden a rational interpretation of the events. As the Tunisian people know all too well, this is only the beginning of the road and there are substantial risks ahead. I don't wish to be pessimistic, but the formation of the national unity government today has left most of the power in the same hands. To call this a revolution at this stage is a grave, but perhaps pardonable, error of judgement. Tunisia may have taken another step towards becoming more democratic, but this is far from a radical upset of the power structure. But, I say again, I am not dismissive and the Tunisian people can still take matters in their own hands. To complicate matters more, much has also been said about how this is a 'revolution without a leader'. This is a dismissive attitude and also one that favours a fantasy version of the events. 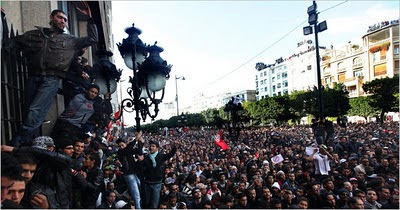 It is dismissive of the role that the Tunisian opposition in all its wings has played in this uprising. The high number of political prisoners in Tunisia is testament to the fact that the opposition had been active for decades, if ineffective. The fans of the Wikileaks/Twitter school of thought may like to promote the idea that is a visceral type of uprising, but this only downplays the role of political organisation and its importance for genuine political change. There may have not been a clear leader during the demonstrations of past few weeks, but this does not mean political organisation did not play a role in how events unfolded. The so-called 'ripple effect' does not take into account the state of political organisation within every Arab country and the availability of a strong, if repressed, opposition parties. In Egypt for example, the opposition has been tamed by decades of oppression and appeasement, as evidenced by the fact that the most celebrated opposition figure is a former UN bureaucrat who has spent the last three decades away from Egypt and its politics. Other countries suffer from deep demographic 'fault lines' that are likely to consume any uprising and turn into a sectarian war, much like what happened in Lebanon in the 70s. This is not a simple story of 'dictators versus the people': most of the rulers, although autocratic, derive their power from complex structures that are patriarchal and traditional in nature. Ironically, it is perhaps Tunisia's harsh state-driven secularisation and modernisation that may have contributed to this uprising indirectly. There is hardly any other Arab country that has gone through similar transformations since independence. The bitter irony of the Tunisian uprising is that the hopes that it inspired have been taken all too literally by some. There are various reports of people setting themselves on fire across the Arab world in the hope, perhaps, of sparking similar uprisings. But this is anger turned inwards, albeit for the sake of higher aspirations. Tunisia should not a prototype Arab revolution but a universal lesson in the value of the fight for freedom.